have to tell you Alida from Alida Makes has come up with such a great idea, it combines my two passions: Sewing & TV! 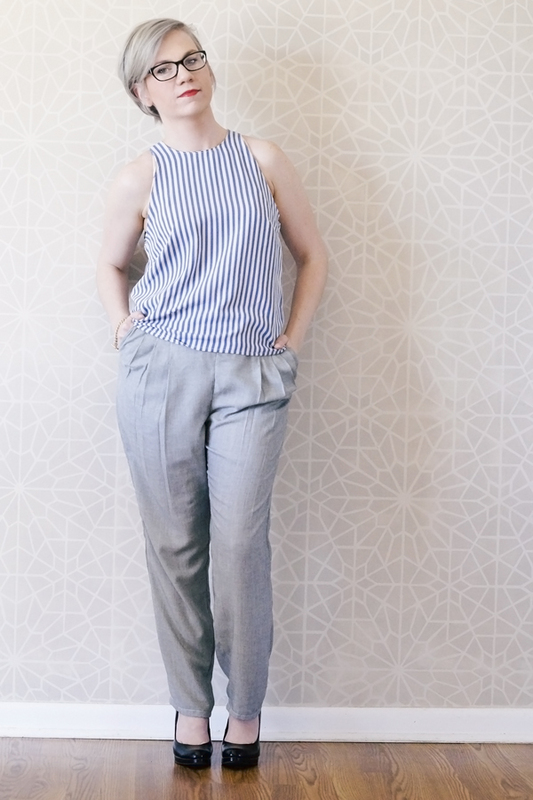 February's pick for Sew the Show was The Honourable Woman, which was a great little mini series and it features one of my celebrity girl crushes Maggie Gyllenhaal. Now Nessa Stein is all about that business, and pleats! I think the most notable takeaway from her wardrobe was the perfectly pleated and pressed pieces. 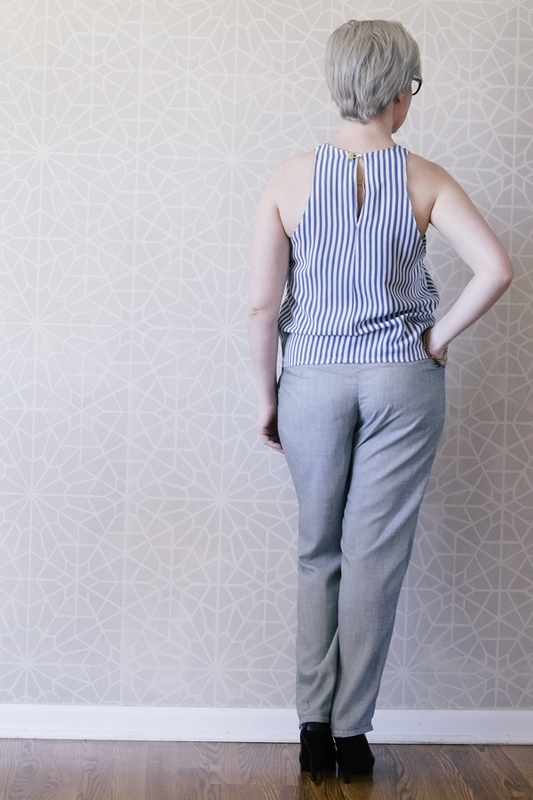 I chose BurdaStyle's pleated pants which was surprisingly quick to sew. It helps that there is no zip fly, just a side zipper and I have to thank my Ginger Jeans for giving me the confidence to whip these up. The fabric is a stash blast! This very light/almost see through cotton/ linen blend was pretty easy to work with. Ironing was a different story. I pressed and steamed these pants right before taking pictures and, well you can see that they wrinkle pretty badly. But that's the story of linen I guess. Because they are so light weight, they aren't suitable for our current weather, below freezing. They'll have to be put away until Spring. 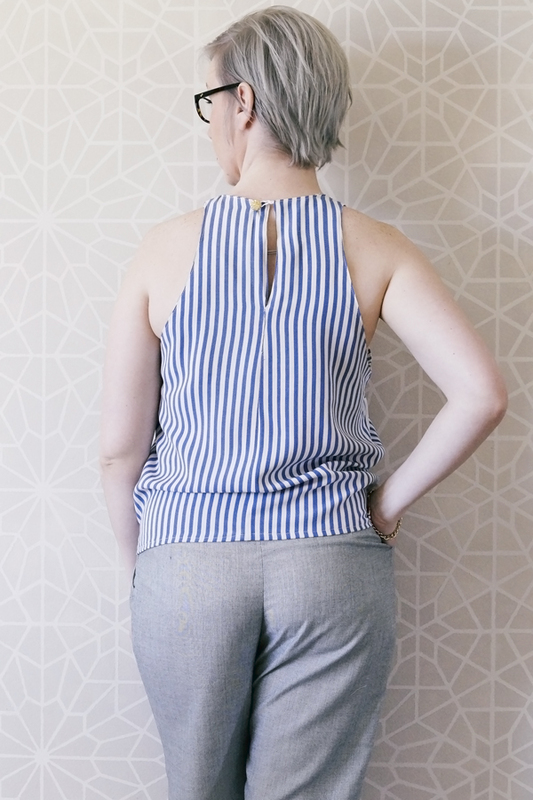 The shirt pattern is Spit Up & Stilettos Isabella Tank, WHICH IS FREE! Get over there and download now before she realizes that she's too talented to be giving these patterns away! The fabric is also part of my stash blast, so you get 2 stash blasts in 1 post, woohoo! I love the cut out of this shirt, I do need to find a lower bra to wear with it, or at least make a cute one or something. I used ric-rack to make my closure, because I was too lazy to make a button loop out of real fabric! Just being honest. I think this would be a great shirt pattern to make into a comfy summer dress. I'd definitely have to grade out on the hips. 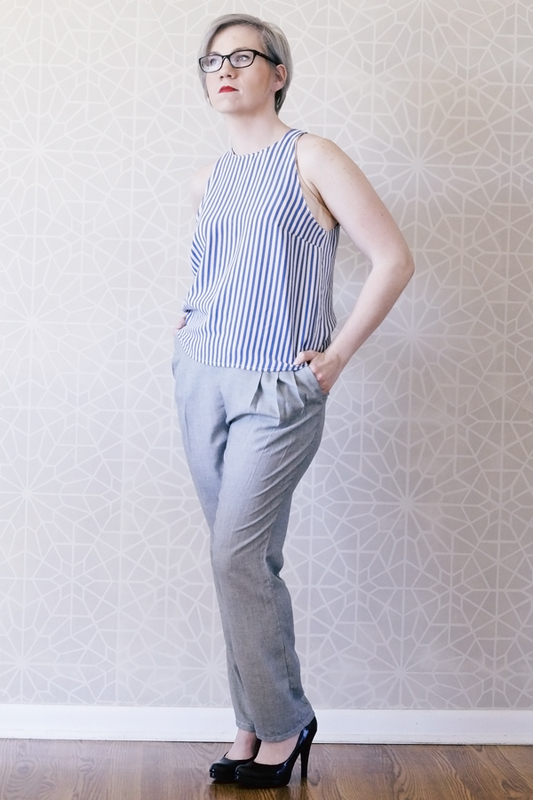 And I wish that this pants pattern would have had welted pockets. Love the look. Definitely something Nessa would wear. Both fabrics are stunning! I love that top! it looks perfect for summer. I think Spit Up and Stilettos' site is down. Hey I love the combo! 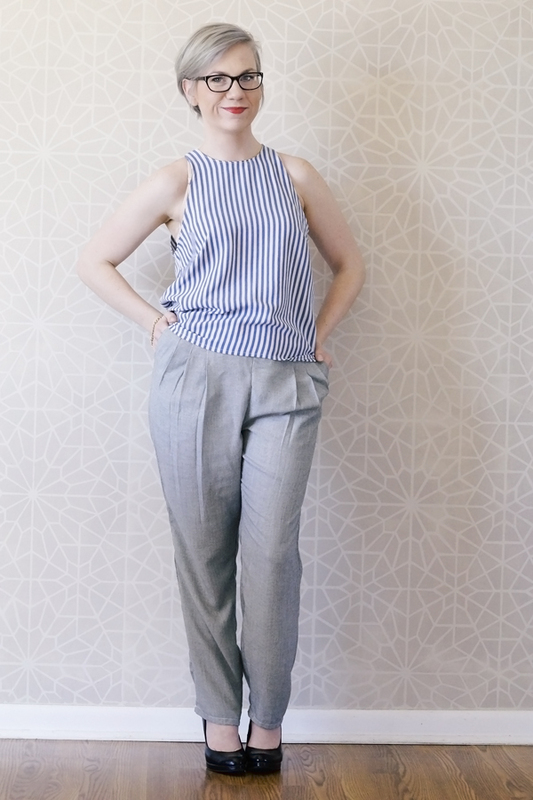 I made these pants too http://mswabisabi.blogspot.co.nz/2014/09/burda-pants-with-hip-yoke.html. But yours look much better!!! Thank you so much! I can't wait for spring when I can actually wear them! BS! Your pants are awesome! I totally want to make a pair of florals now! And I agree about the magazine, I do like some of their patterns but there are a lot in there that aren't really my thing, and the instructions are hard to follow. Well shoot! Those were some amazing patterns. Hopefully she's just doing maintenance and it'll be back up soon! thank you so much! I had fun coming up with the outfit! Totally chic. I've just found your blog and love what I see.